Hi! 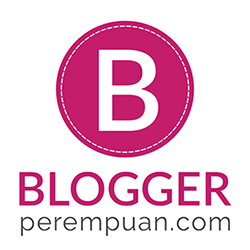 I'm back with another blog post. Whoa, so diligent these days.. (Thanks to scheduled post, LOL). So, I bet that most of you are already familiar with LANCÔME, especially GÉNIFIQUE. An innovative hybrid in skincare technology – the skin-perfecting properties of a serum infused in an exquisitely hydrating cream. Containing a unique complex, this formula intensely hydrates and promotes skin's natural exfoliation, a characteristic of young skin. I already tried it, though it's only sample-size product (5ml). I like the gel texture of the serum, plus it absorbs really fast! No more sticky feeling. I used this serum as my very first step in skin care, followed by cream and sunscreen. 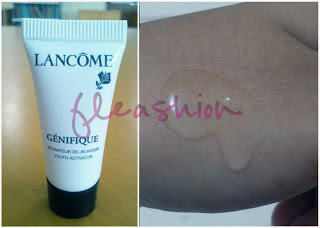 This picture is taken from my impression post about LANCÔME Beauty Bloggers Duel. 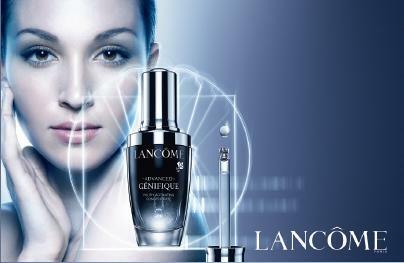 LANCÔME has released its New Advanced Génifique for smoother and more radiant skin that you can see and feel. First results in just 7 days! It's an exclusive innovation: the advanced self-loading dropper that gives you the perfect dose of serum for each application. 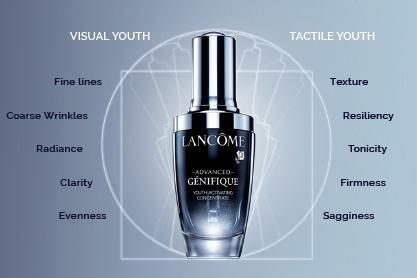 It also claims to be able to reactivate the 10 key signs of youth, day and night. This innovative formula, featuring Génifique’s powerful new complex with added biotechnology-derived ingredient, is incredible to the touch. If you ask the price, well, it's pricey. But I believe price is one of the way to define quality. It costs $82, but do you know that it took 13 years and $ 13 Billion to invest in research for this product? As my previous post told you before, this product is also developed with stem cell technology. Yes, LANCÔME is a cosmetic brand which prioritize research and development. 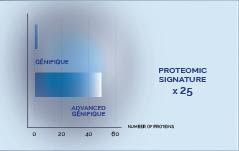 And this product is a result of the potential relation between Gen (Genomics) and Protein (Proteomics). The latest research and innovation then creates the upgrade of Lancôme Genifique, which is ADVANCED GÉNIFIQUE . Six points above are the unseen parameter to help your skin to stay young. Hmmm, let me check mine first, LOL. 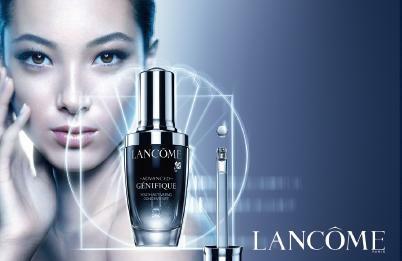 What's more exciting is that this ADVANCED GÉNIFIQUE is clinically proven to improve and activate 10 visual and tactile signs so that your skin can stay young. You can definitely use this both at mornings and nights. What are the differences of this ADVANCED GÉNIFIQUE and (previous) GÉNIFIQUE? 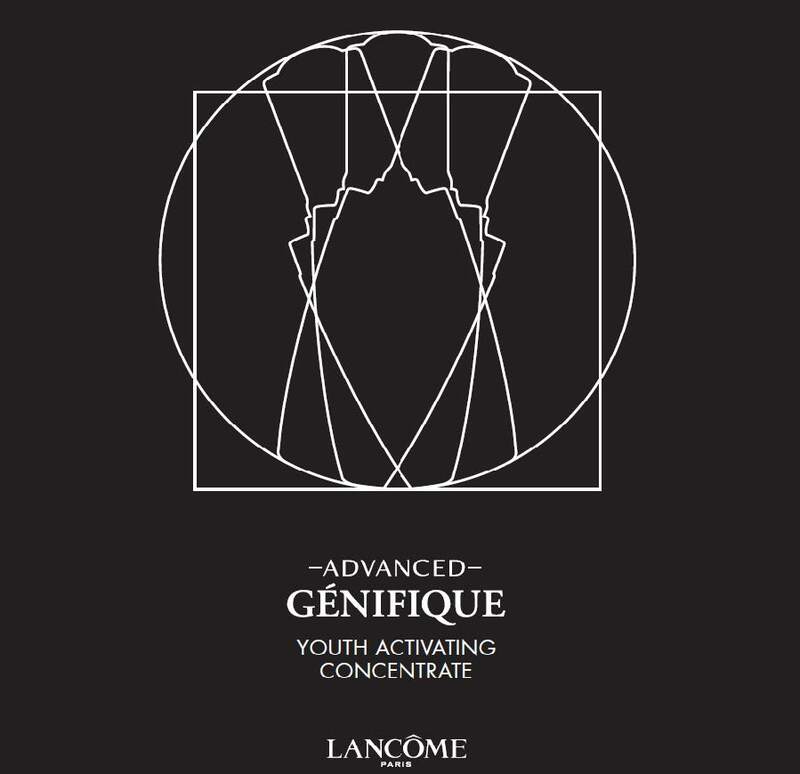 The answer is that ADVANCED GÉNIFIQUE has 40% more active ingredients in order to achieve faster and more effective skin rejuvenation. 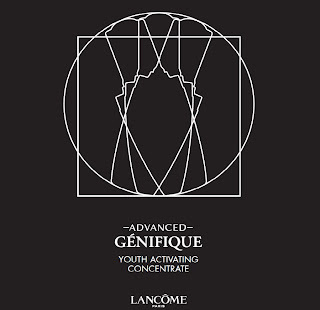 ADVANCED GÉNIFIQUE has fresher scent which absorbs faster to your skin. The design of the bottle doesn't change much, but now it has engraving logo of Lancôme Rose on both cap and droppers. I bet it must be beautiful! 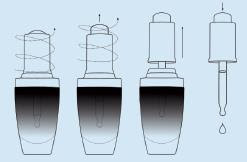 Moreover, it has self-loading droppers so the dose of each usage can be automatically drawn perfectly. What makes me curious the most is that it claims to show the effect right after the first drop of usage! It says that after that, our skin will be smoother, firmer, and brighter. 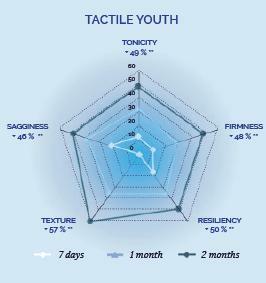 After 7 days of routine use, we can notice the significant difference of younger skin. 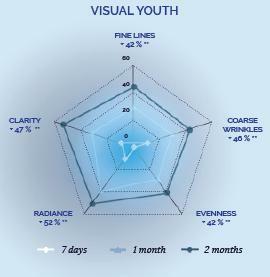 And after 8 weeks, 10 signs of skin rejuvenation are clearly shown on our skin. I'm curious about this, how about you? botolnya juga mewah, praktis ya ada pipetnya gitu..
menarik nih produknya lancome yang satu ini.. tapi gak apa2 tuh dipake tiap hari, kan ada exfoliatornya?